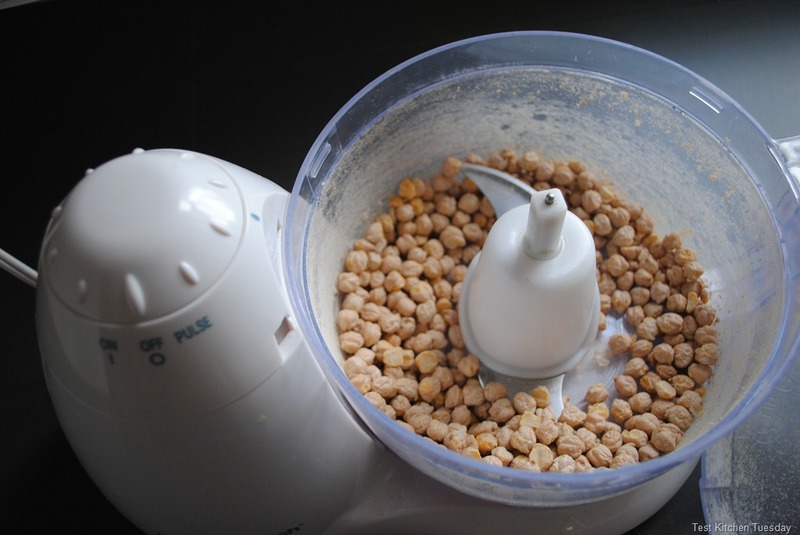 Can a Ninja Blender Make Garbanzo Bean Flour? 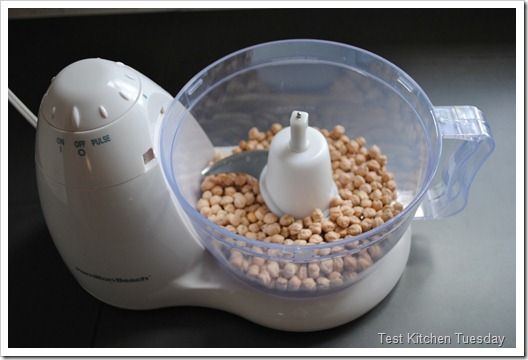 Today’s topic comes to us from the comments section of the blog, where Kimberly asked if it was possible to use the Ninja Kitchen System to grind garbanzo beans – or other beans – into flour. While I had never done this particular task before, I was pretty confident before starting that the Ninja would eat up the beans and effortlessly spit out flour. Being that I like garbanzo bean flour, as it makes a good binder in veggie patties and thickener in soups, I went with garbanzo beans for this little test. 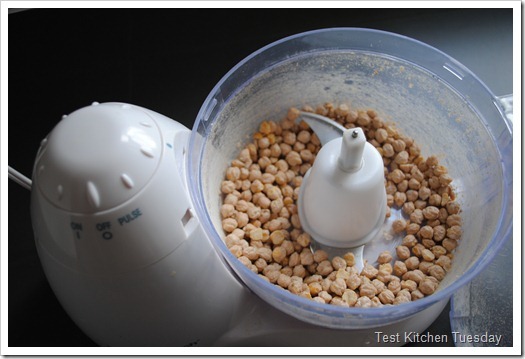 Since I felt confident in the Ninja for this task, to up the ante a little, I did a side-by-side comparison to see if just a normal food processor could handle the task. 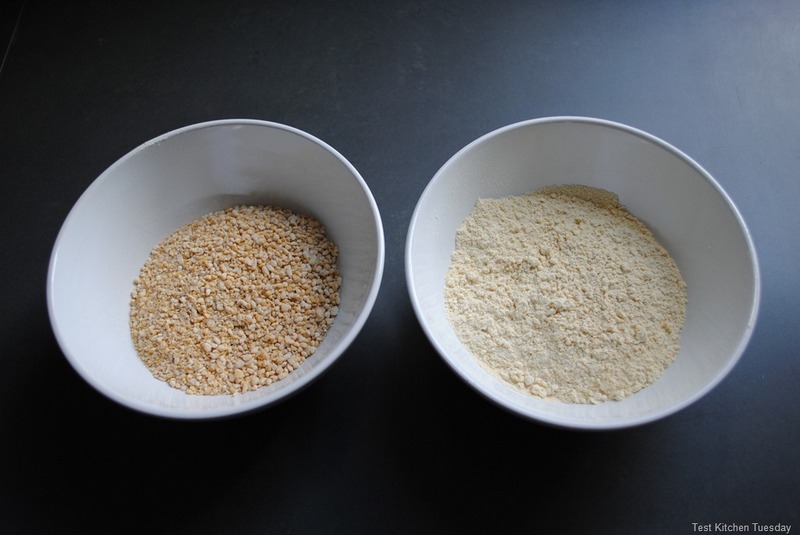 Dried beans are very, very hard – so I figured a head-to-head test might be interesting. 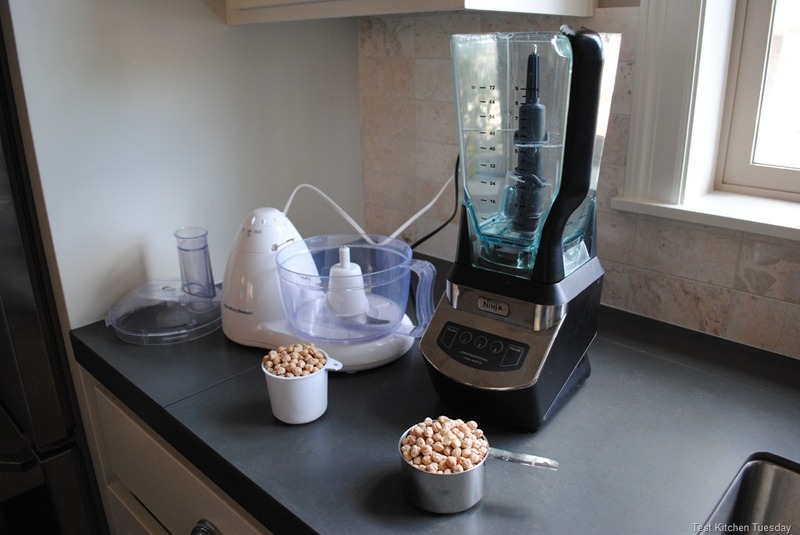 Here we have just a cheap Hamilton Beach Food Processor and the Ninja Professional Blender. 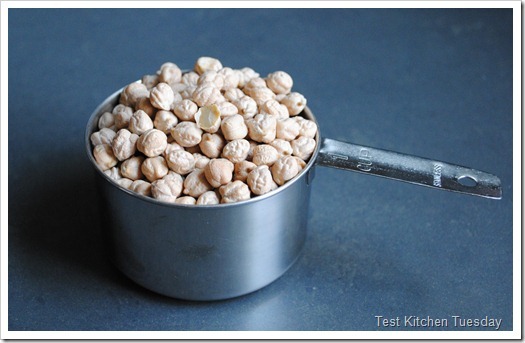 Each have one cup of dried garbanzo beans ready to blend. First up, the Ninja. I added one cup of dried beans. Then, I blended on power level “1” for about 30 seconds to get things going before switching to power level “3” for about 90 seconds. Warning: This is loud. After 2 minutes of blending, it really seemed that I had about as fine a flour as I was going to get. So, I poured the flour into a bowl – and immediately realized it needed to be sifted. 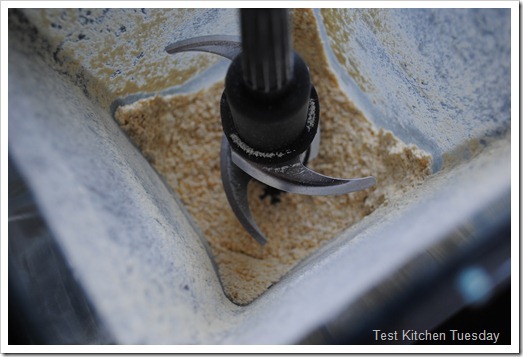 Out came my trusty mesh strainer and I quickly sifted the powder into a fine flour and separated rough kernels. In the end, the yield was about 3/4 cup of very light, powdery flour – just like you’d buy at the store. You could probably “re-process” the leftover kernels and get even more, but I just didn’t fuss with that for today. The point was to see if the Ninja could produce flour, and it certainly can! 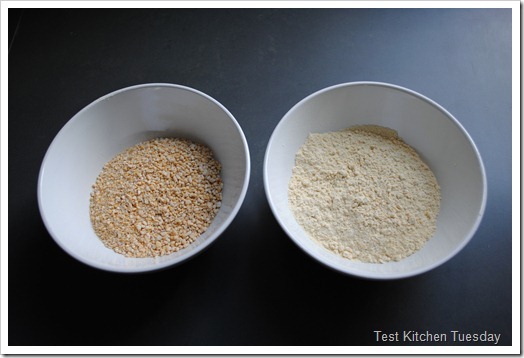 With a successful test complete, I set off to see how a traditional food processor would stack up. 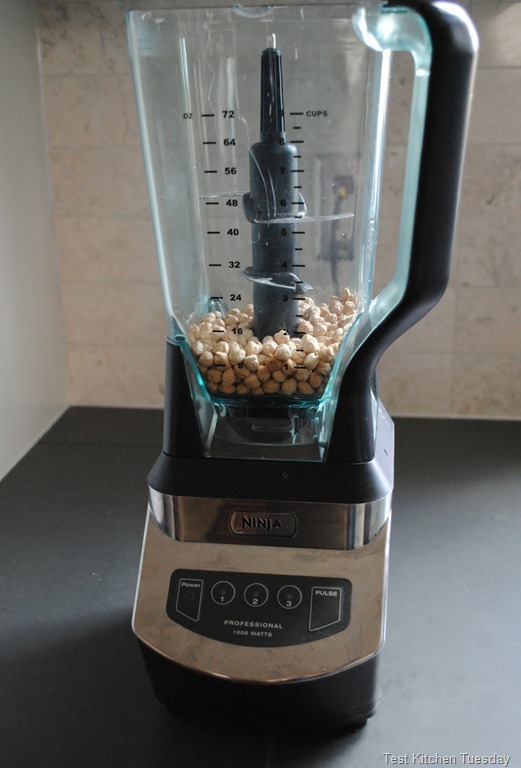 I added one cup of dried garbanzo beans, just as I had for the Ninja. My food processor is very basic, so it doesn’t have speed levels. It just has “On” or “Pulse.” For this test, I put it in the “on” position and let it process for 2 minutes – the same amount of time as the Ninja. Holy cow, if I thought the Ninja was loud, this sounded like a warzone in my kitchen! It doesn’t look much different, does it? The food processor portion of this experiment was a definite FAIL. 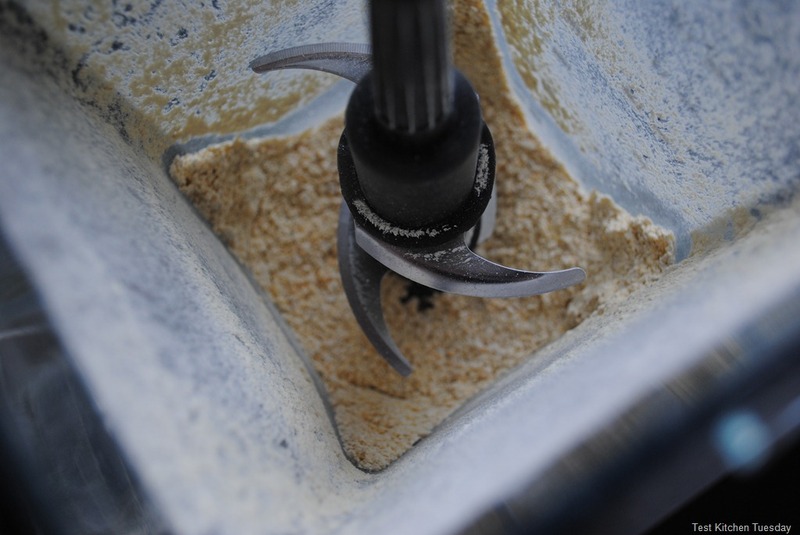 The morale of the story – you definitely need a high speed and high powered blender to make dried bean flour. I hope you found this test helpful, and as always, if you have Ninja Blender requests, let me know in the comments section! wow, what a great test! And even though the ninja didn’t pulverize every little bit of the bean, it’s easy to sift out the larger particles! It’s funny, in the photo, it looks liquidy, like oatmeal! Thanks for your test, Angela. 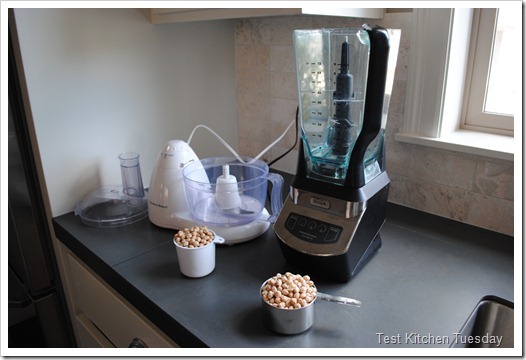 I’m going to have to try this with my blender, and maybe even my food processor. That’s funny about the oatmeal look alike! It’s definitely a very fluffy flour – I make kind of a mess when putting it into a storage container and had light powder everywhere! Do you have a coffee grinder? It strikes me that would probably work pretty well for this purpose, but I didn’t try it in the test. Let me know if it works in your blender! No, I keep thinking about a coffee grinder, but then I read reviews and they break so easily unless of course you spend a fortune. I don’t know if I’d use THAT much bean flour, so to spend the money on an expensive tool is a bit excessive. Just tried it! After the first run through I separated the flour from the coarse bits with a flour sifter I did not have any finer mesh. I first tried to grind the coarse bits – did not work- threw those out and next time I will not even try to grind the first round coarse bits. Then I took the finer flour, but still a little rough for me, and stuck it back into the ninja for another minute or two on 3. It broke it down further, and I have a good amount of flour that is similar to how almond flour looks and feels- It is hard to find chickpea flour, so this is just terrific! Thanks for the inspiration! Thanks for your tips, Diane. I have yet to try making flour with my new ninja pulse! Have you tried any nut flours? I have used the leftovers from making almond milk as almond flour, and that works pretty well. 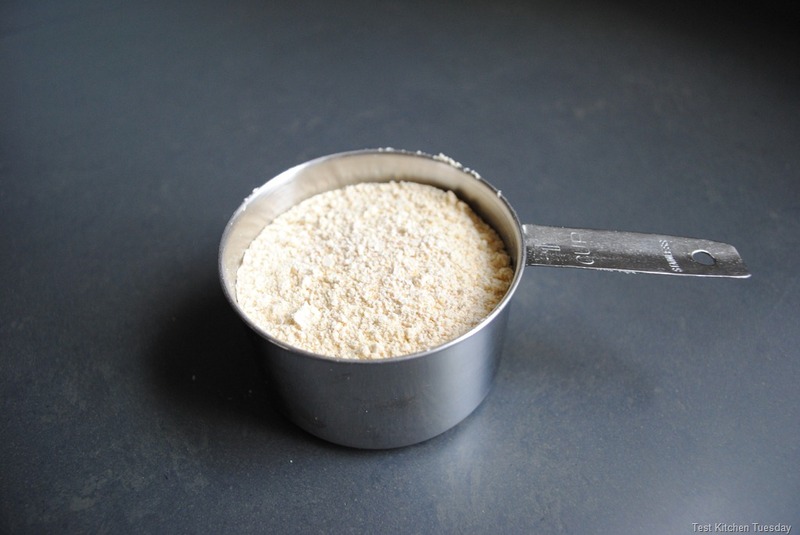 It is possible to make nut flours without making nut milk, but you need to be very careful — you can go from nut flour to nut butter pretty quickly! Just keep an eye on the nuts and keep it “stirred up,” not letting big clumps form in the corners….Good luck! I am just thinking of trying my Ninja to make an instant refried bean mix. I am so glad I found this because I don’t want to harm my ninja with an experiment. For the refried bean mix it doesn’t have to be as fine as flour. You simmer it for about 5 minutes to reconstitute and I think some lumps are nice to add a more realistic texture. You think I could get by NOT sifting out the kernals since I’m not using this recipe as a true flour? Would those unsifted nugets actually cook in that 5 minutes of simmering? Thankx so much in advance for any help on this. That is a great idea – I had never heard of instant refried bean mix, but, talk about a time-saver. As to if you need to sift, hmm. I think you do (though this takes less than 30 seconds – it’s quick). The remaining kernels are pretty rock hard, as they are the last part of the bean that wouldn’t grind. I’m guessing they won’t cook in 5 minutes of simmering. I think if you leave them you’ll end up with “tooth-breakers” and won’t be happy with your mix. It helps immensely Angela. Thankx so much. Nother quick question: I’ve never used a sifter. 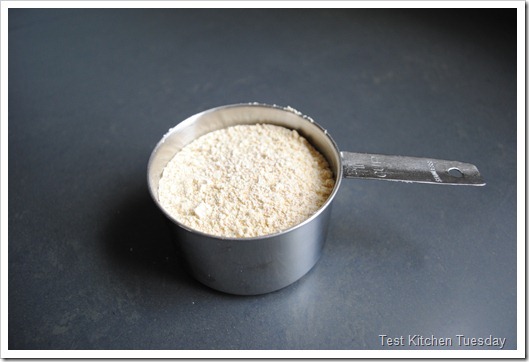 Do you a suggestion to which I should buy to sift the bean flour? Thankx again! You can pick up a mesh strainer at Target or even your grocery store – doesn’t have to be fancy at all. I use this one for fine sifting: http://amzn.to/XWJ4WP along with a no-name one I got at Albertson’s in the cooking section for less-fine sifting.They come in different gauges, so it is probably best to go to a store and compare to find one you like. For sifting beans, you don’t need super fine mesh, which will let the flour fall through easier. Good luck! Thankx again Angela. You’ve been a great help. I can’t wait to get my sifter from Amazon so I can try this recipe. Just got my Ninja today and am waiting for it to dry to grind some pinto beans for the refried beans. I just wanted to let you know I am so glad I found your site. I appreciate your quick responses and love all the great info!!! Thanks!! Thank You All for the great info, I will be buying a Ninja this month! Thanks for doing this experiment and posting it! I am about to become a stay home mommy, and I am looking for ways to make a variety of foods on the very cheap. 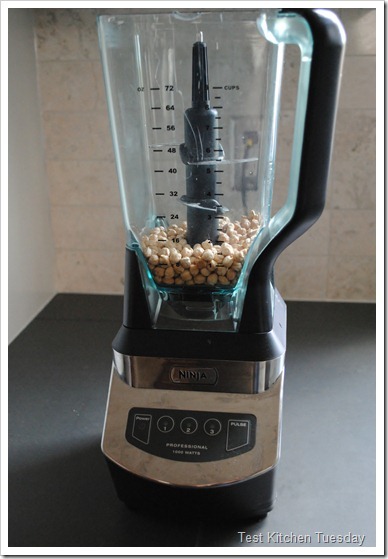 We love falafel, and it looks like the ninja will make perfectly ground beans for that. I’ll let you know how they come out! Congratulations! 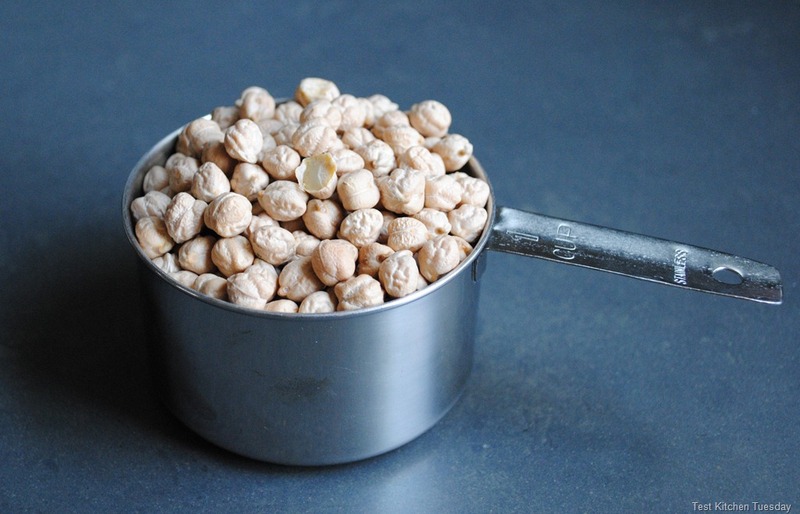 The Ninja can make great chickpea flour – definitely let me know how your falafel comes out. Yum! For those thinking of grinding up dry beans for mixes, keep in mind that beans need to be presoaked for maximum digestibility and nutrition content. Unsoaked beans contain phytic acid and enzyme inhibitors that will cause you to have gas, heartburn, and reflux after eating them. Store mixes have already been processed by soaking, cooking, and drying. That is an excellent point, thank you for chiming in, Laura. I updated the blog post with a quick note about this. Thanks much! I would think that you should dry the beans after soaking and before grinding them. Is that true or can you grind them still damp. You definitely want to dry them! Angela, how long do the beans have to dry after soaking? I’m thinking they still need some moisture? You want them dry, because otherwise you’ll get moisture in your flour, which will make it moldy. So, I’d say dry them over night. Yes it does, Thank you!! I’m a bit confused about the soaking. Are you saying first to soak the beans overnight, as you would if you were going to cook them, then let them dry out for a day before grinding? Sorry for the delay! I would soak the beans at least 4 hours, and then let them fully dry for a day before grinding, just to make sure the moisture is out. You could also dehydrate them if you have a dehydrator. My ninja isn’t the stand up version but the one with various bowls, blades and two engines. You want to let them fully dry out — overnight or longer…You can also skip the soaking if you want. There are lots of schools of though on this – some people think you need to soak, others think you do not. I wonder if this could grind dry beans to flour? Yes, that is exactly the purpose of soaking! Some people buy into that, some do not (I do). Hmm, I’m not totally sure if that model will work because you really need the power of the larger Ninjas for this process. You can give it a try. The worst that will likely happen is…nothing…much like what happened when I tried using my food processor for comparison. If you try it, let me know – I would like to know what happens! Thanks Angela. I’ll give it a go and let you know the results. Thanks,I appreciate it. I’d like to make my own garbonzo bean flour.:-). 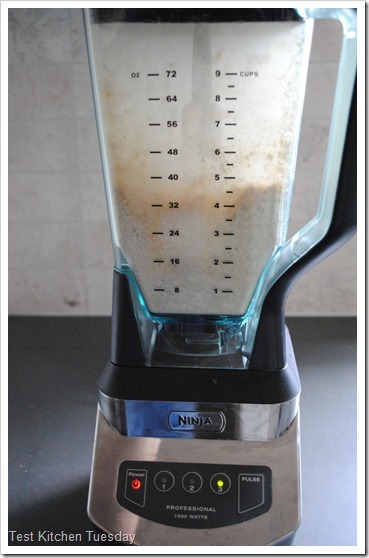 Thanks for sharing this Ninja vs. Bean experiment and the results! Glad to know the Ninja can make bean flour. 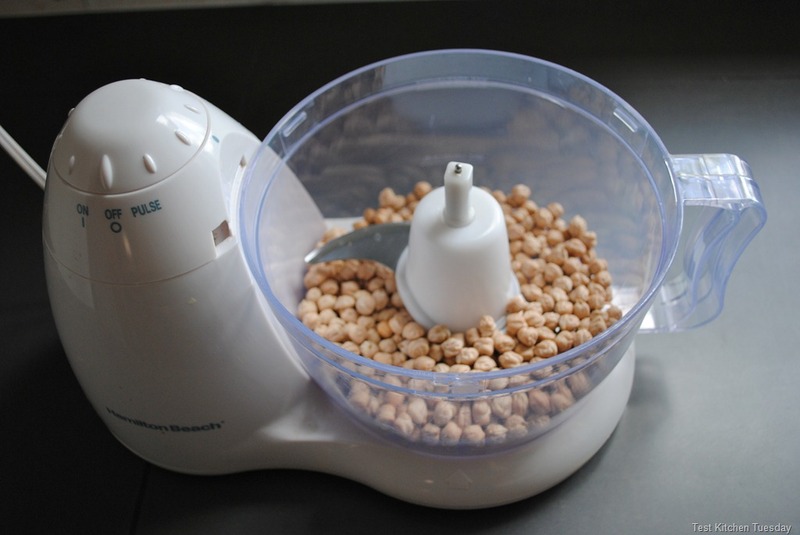 I’ll have to do this later on today with my sister’s Ninja (since I don’t have one yet) to make flours out of navy beans and maybe black beans. Great, Bari! I hope it came out well for you!